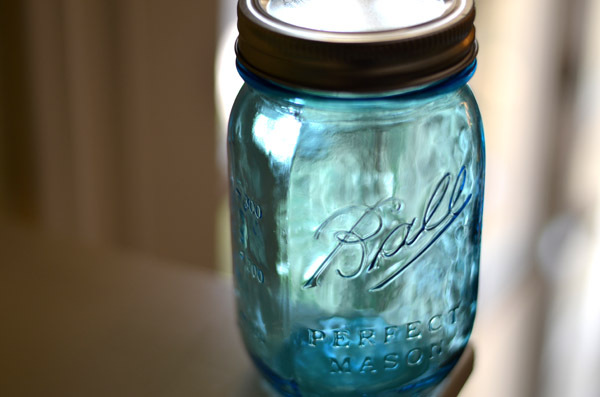 I just adore these traditional all-american Ball Mason preservation jars. They automatically bring back memories of Thanksgiving as our neighbor's would (and still do!) gift us with the most amazing cranberry chutney you have ever tasted preserved in these Ball Jars. Well, I'm helping Ball in their 100th Anniversary celebration as their journey started in 1913 in Muncie, Indiana (can you believe I have friends that live there!) And they are commemorating this jar that revolutionized the home canning process with a beautiful limited-edition Ball Heritage Collection Pint Jars. How am I celebrating this jar anniversary?..... 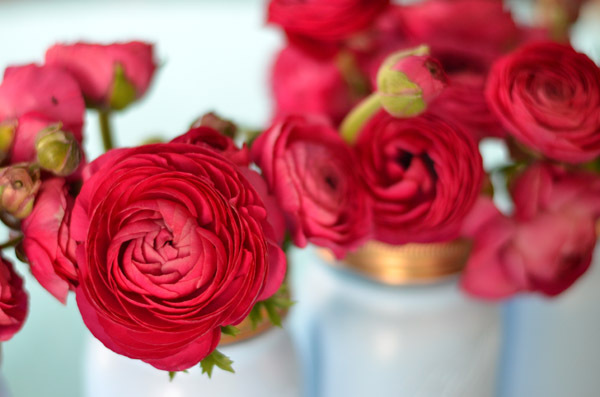 with spray paint and ranunculus of course!! So it all begins with a jar that looks like this- I just added this awesome Valspar paint (primer and paint in one) in Satin Encounter (this is the name of the color). I applied two coats and then spray painted gold the lids with a primer first and then two coats of metallic gold paint. I adore the shade of blue combined with the gold! 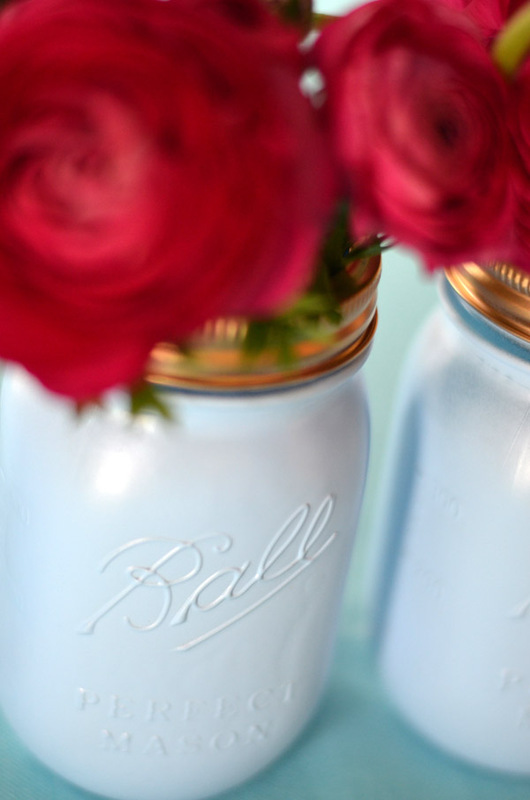 What is better than one Ball Mason Jar? Why five of course!! And did I mention they are 100% Made in America and BPA Free? Need 'em? want e'm? You can get them here. What are you celebrating today? Love this!! I have some Ball mason jars of my own that I need to be repurposing!! I love this, it is so fresh. The hot pick flowers are beautiful in it. These are beautiful! 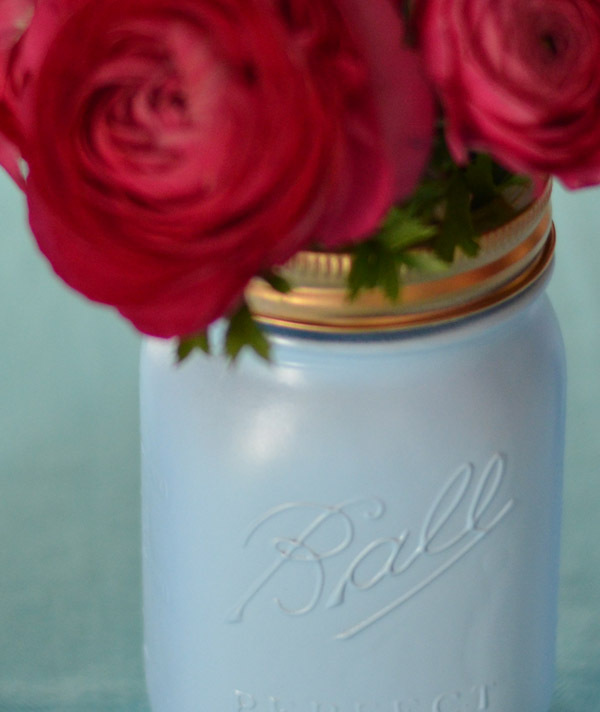 Did you paint the inside or the outside of the jar? ooo I love them! so beautiful! 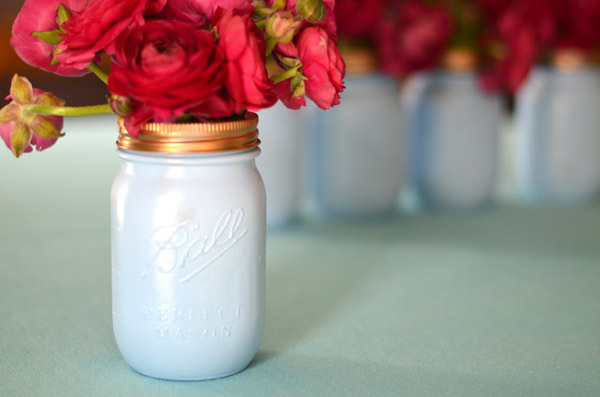 I love how easy mason jars are to customize to decor. I just painted a bunch in pastels. Love your gold tops! crafty you are! - super cute!!! .. i'm celebrating it's MAY and it's dress weather!!! Your photography is incredible, Albertina! And those ranunculas. SOOOOO beautiful! We need to catch up soon! I love this idea, its such a pretty display, especially with the roses. Great post! Oh what a pretty and perfect little display. 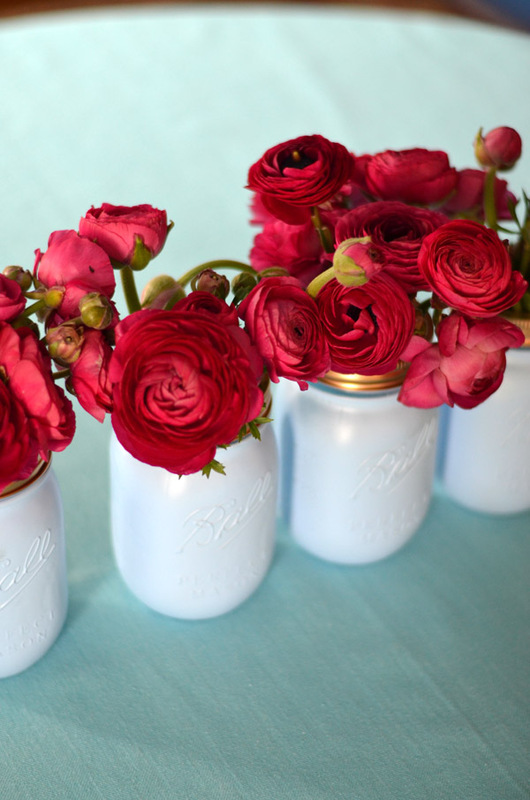 I have a few mason jars, so will have to give this DIY a shot! I have the pretty blue jars & I'm not sure I can bear to paint them! But yours look so fabulous!! Great little project Albertina! We've been using them as drinking glasses of late. Iced coffee and bloody mary's never tasted so good! Loved the work on this post too! And I love the pictures you took with those lovely red roses!!! Thanks for the shout out to Muncie and the Ball legacy. An amazing product and an amazing family. You should come visit your friends here! Great post. no no no, BEAUTIFUL!!! The photos are sooo pretty Albertina, love love love this! beautiful! 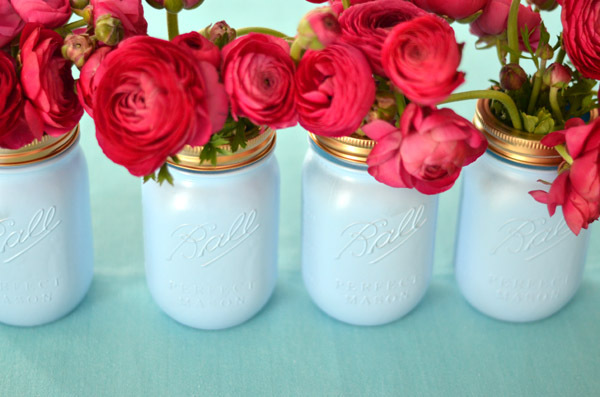 love the jars and the flowers are gorge too. I actually bought some ranunculas this weekend too. love them. I am definitely trying your DIY! They look amazing! These are so perfect. I'll be using bell jars for a party in June and I think we'll need to up their glam factor like this! Ok these are too cute! 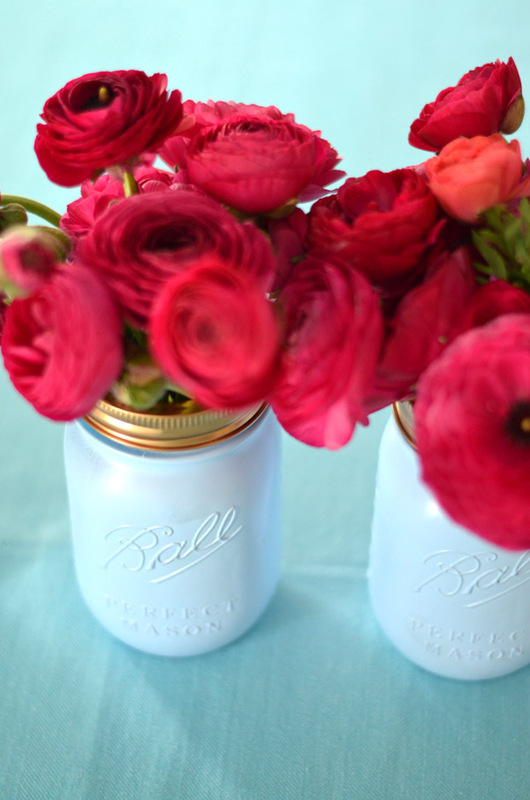 Love a new twist on the classic jar. So pretty - and I love the GIF you created. 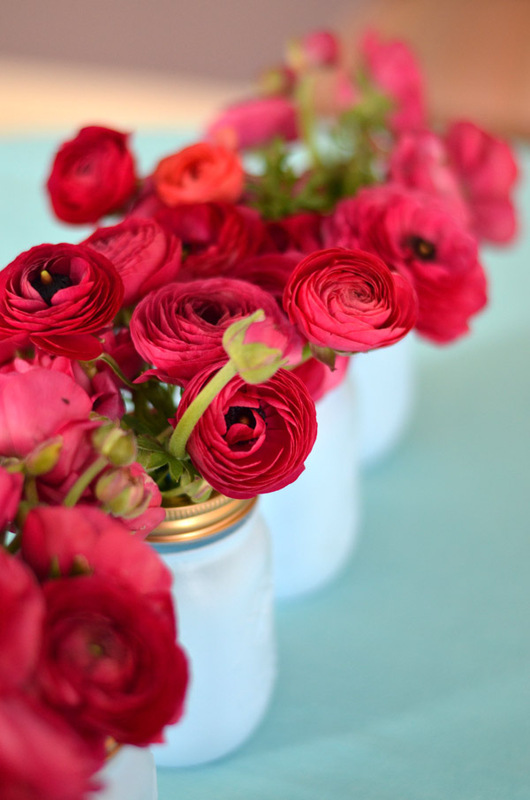 The contrast of the white of the jars against the red/pink of the ranunculus is gorgeous. Love these Albertina! Are these the 16 oz?